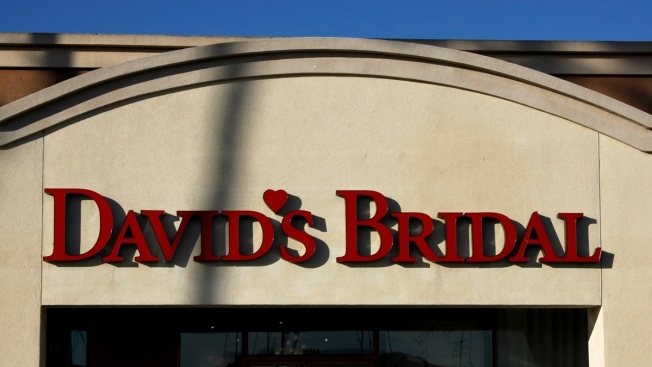 In this undated file photo, a David's Bridal sign is shown in Huntington Beach, Calif. The bridal store said it plans to file for Chapter 11 bankruptcy in the "near future." Wedding dress retailer David’s Bridal said on Thursday it will file for bankruptcy in the “near future,” as it grapples with a heavy debt load amid changing consumer tastes in the wedding industry. The bankruptcy is part of a deal the retailer has reached with its lenders that will reduce its debt by more than $400 million. David’s Bridal said in a statement the company will continue to operate throughout bankruptcy. Customers can continue to shop in its more than 300 stores, and its orders and appointments will not be impacted..
“David’s Bridal will continue to lead our category with an unbeatable selection of beautiful, high-quality wedding and special occasion dresses in a wide range of styles, colors, sizes, and prices,” CEO Scott Key said. David’s Bridal’s term loan lenders have offered $40 million to help support the retailer’s operations throughout its bankruptcy. The bridal store was acquired by private equity firm Clayton, Dubilier & Rice in 2012 for roughly $1.05 billion. The imminent bankruptcy comes roughly a year after bridal store Alfred Angelo liquidated its business, another victim of the changing times. Millennials now marry later on. When they do, they often opt for non-traditional garments. Newer online retailers like Reformation now offer brides more relaxed alternatives to the traditional gowns worn in years past. David’s Bridal made its own online push, buying digital gift company Blueprint Registry this past summer. It can be hard though, for traditional retailers hamstrung by debt to build up the infrastructure necessary to support an expansive e-commerce business.